The Jewish Federation of Greater Dallas invites its supporters to the 2010 Annual Meeting on Tuesday, June 22, with a reception at 6:45 p.m. in the Zale Auditorium at the Aaron Family JCC, 7900 Northaven Road. The program, starting at 7:30, will honor outstanding leaders in the Jewish community who have demonstrated excellence in their support of the Federation’s 2010 Annual Campaign. The agenda also includes the election of new officers and board members. The annual meeting is chaired by Barbi and Scott Cohen. The slate of new officers and board members selected by the Nominating Committee are Jeffrey Rasansky as chairman-elect and Vice-Chairs Harold Gernsbacher, Brian M. Lidji and Barbara Stein. Board members nominated for a three-year term are Shelley Becker, David Greenstone, Cindy Sweet Moskowitz, Todd Platt and A.J. Rosmarin; for a two-year term, Jack Baum and Eric Pinker; Robert L. Feldman, Daniel J. Prescott and Cary Rossel have one-year chairman’s appointments to the board. Other board members include David Veeder, Chairman, Michael A. Cohen, Seth Davidow, Stefani Eisenstat, Adam W. Fenster, Fred Grunewald, Rick Lacher, Sharon Levin, Lillian Pinkus, Frank A. Risch, Rabbi Adam J. Raskin, Ari J. Susman and Sue Tilis. 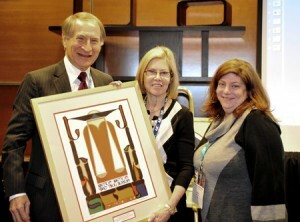 Carol Aaron is the past chairman and Gary Weinstein, president and CEO. Stuart Blaugrund and Louis Zweig will be accorded special recognition for their dedicated work on behalf of Federation and the community; Bill Finkelstein will receive the Campaigner of the Year Award; Sandy Cohen, the Helen Gross Leadership Award; Doug Baer, the I. Zesmer Young Leadership Award; and Stacey Baer, the Bess Nathan Young Leadership Award. We will soon mark the fourth anniversary of the kidnapping of Cpl. Gilad Shalit of the Israel Defense Forces. On June 25, 2006, after an infiltration and attack by terrorists near Kibbutz Kerem Shalom in southern Israel, two IDF soldiers were killed and four others were wounded. Gilad Shalit was abducted and has been held by Hamas in the Gaza Strip ever since. The International Red Cross has been denied access to Gilad, and his exact whereabouts and physical conditions are unknown. A video of Gilad, released by Hamas in October of 2009, is the last his family has seen of him. Shearith Israel will participate in a program organized by Koach, the College Branch of the United Synagogue of Conservative Judaism to help further awareness of this ongoing tragedy. The multifaceted program will include an e-mail campaign to send virtual yellow balloons that say “Bring Gilad Home” and also will use Facebook, Twitter and other social networking sites. As a participating synagogue, Shearith will display yellow balloons throughout the week of June 21 to show solidarity with Gilad, and will include special prayers in all services. The campaign urges people to write to their elected officials asking them to maintain pressure on the international community to free Gilad, and to write to his parents expressing support. Shearith Israel will have an information table throughout the week, and members can sign letters at Shearith during its Blues Sunday program on Sunday, June 27. On Friday, June 25, a few members of the Israeli teen performance group, Israel Scout Tzofim Friendship Caravan, will give a special performance at Shearith Israel’s north satellite, Beit Aryeh, located on the campus of the Ann and Nate Levine Academy, 18011 Hillcrest Road. The AJC Dallas office was honored with American Jewish Committee’s first-place Szabad Award during its 104th annual meeting in Washington, D.C. in May. The Szabad Award, originally named in honor of the late Shirley M. Szabad, a longtime AJC leader from Westchester, N.Y., is bestowed for an outstanding program or project among the 28 regional AJC offices. Catch the spirit of Joyful Noise at Beth Torah! The sounds of Louis Armstrong, Benny Goodman and Artie Shaw have nothing on the Joyful Noise Ensemble involved in enriching early Kabbalat Shabbat services at Congregation Beth Torah. The name of the group originates from a biblical quote, “Make a joyful noise unto the Lord,” and its members capture incredible energy and spirit. The goals of the service are to encourage congregational participation by providing compelling and exciting tunes to prayers already known. Bob Austein, percussionist and longtime congregant, marvels that people from preschoolers to seniors wind up with smiles on their faces, songs tripping from their mouths, hands clapping and happiness exuding from their pores. Early Kabbalat Shabbat services are offered only during the spring and summer months in order to take advantage of the late setting of the sun and to be respectful of synagogue traditions regarding the use of instrumentation once Shabbat begins. Joyful Noise service books with transliteration and translation are provided to enable participants to feel fully comfortable and to join in the joy of this vibrant Shabbat service. Capturing incredible energy and spirit, the group includes keyboard, soprano sax (which can create a wonderful “klezmer” sound), flute, harp, guitars and percussion. The biggest compliment is when upcoming bar/bat mitzvah families request that Joyful Noise services be conducted on their child’s important Shabbat. Upcoming Kabbalat Shabbat service dates where you can catch the spirit with Joyful Noise are June 18, July 23 and Aug. 13. Services at Congregation Beth Torah begin at 6:30 p.m. For further information, call Cathey Treider at 972-234-1542. DATA–Dallas Area Torah Association will present a riveting lecture by Ari Schonbrun on Thursday, June 24, at 7:45 p.m. On Sept. 11, 2001, Ari was en route to his office on the 101st floor of the Twin Towers when the first plane hit. He recognized a co-worker who had third-degree burns, and proceeded in helping her down 78 flights of stairs to safety. His astounding story was published in many newspapers and magazines and recorded in a number of books. His heroic story serves as an inspiration to many, and is living proof of the tenacity of the human spirit. Born and raised in New York, Ari Schonbrun moved to Israel with his family at the age of 14. When Ari returned to the United States, he worked at United Mizrachi Bank for ten years, rising to the position of head trader. In 1993, he went to work for Cantor Fitzgerald. The program will take place at Congregation Ohr HaTorah, 6324 Churchill Way, Dallas. Suggested donation is $10. For more information, please call DATA at 214-987-3282. Come hear the former head of Israeli military intelligence and get your summer networking in gear! The Texas-Israel Chamber of Commerce presents “Homeland Security, Global Intelligence, High-Tech Security and Intelligent Buildings of the Future” on Wednesday, June 23, 5:45–7:45 p.m. The speaker, Major General (Res.) Aharon Zeevi Farkash, is a world leading security expert who served as head of Israeli military intelligence and now heads the Intelligence and National Defense Program of the Institute for National Security Studies (INSS) at Tel Aviv University. He also founded FST21 in 2007 with a vision of developing the key to enter the intelligent building of the future with an automated access technology. Don’t miss this exciting opportunity to hear about a variety of important topics including intelligence, technology, security and its applications. The session is especially pertinent for real estate developers, builders and building managers, security companies, telecom/wireless and software innovators, those interested in security and the general public. The talk will be held at Gardere Wynne Sewell, 1601 Elm St., Suite 3000. Dress is business casual. There is no cost to attend, but please RSVP to Greg Yavner, president and CEO of the Texas-Israel Chamber of Commerce, at gregtxisrael@gmail.com.